So Lonely in Gorgeous: Do Rush Everything! 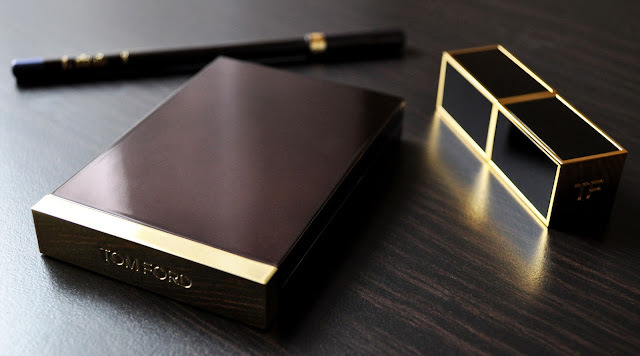 One of my most cherished blue palettes is Tom Ford's gorgeous, and it's beyond me why it was discontinued. 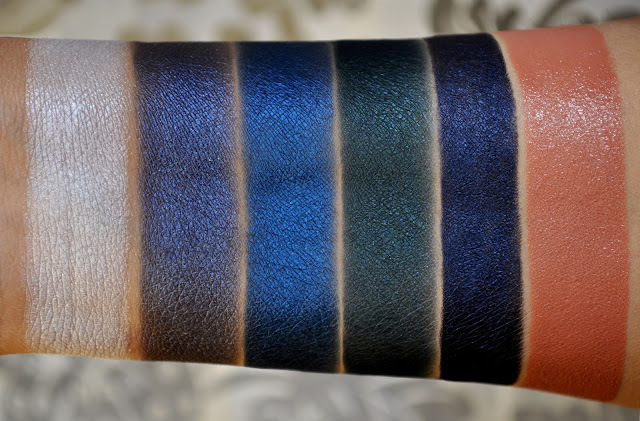 It wasn't until the Spring 2016 collection's release of Starry Night (which I've ordered online, but it's being babysat in the states) that the brand had a blue quad in it's permanent lineup...we'll see how long that lasts. From left to right: 07 Cobalt Rush, 14 Sable Smoke. A mid-tone, cobalt blue with a satin finish. A deep, murky-peacock-blue with a satin finish. 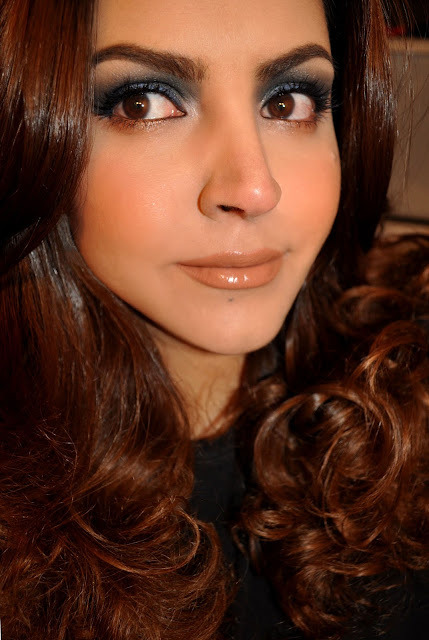 Nudes are my "go to" shade of lipsticks to pair with blue shadows (orange being second), and 14 Sable Smoke is a perfect companion to Cobalt Rush. Nars Sheer Glow Foundation in Medium 2 (Santa Fe). Tarte Amazonian Clay 12-hour Blush in Buff. 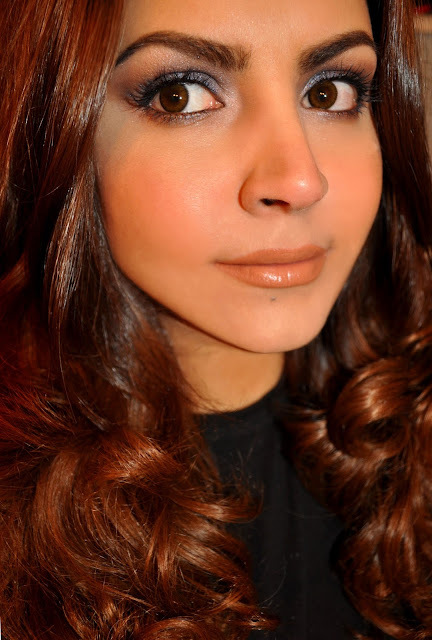 Les Merveilleuses Laduree Shimmering Pressed Powder in 103 (dusted all over the face). Tom Ford Cream Color For Eyes in Platinum (on the lid, blended into the crease and along the lower lashline). The Purple-blue shimmer shadow (patted on the inner half of the lid then blended upward into the inner crease, and patted on the center of the lower lashline). The silvery-winter white shadow (in the inner corner and brow bone). Tom Ford Eye Defining Pencil in 06 Midnight (used to tightline and on the waterline). Dolce & Gabbana Passion Eyes Mascara in Blu Indaco 3. Tom Ford Lip Color in 14 Sable Smoke. Tom Ford Cream Color For Eyes in Platinum (along the lower lashline). The murky-peacock-blue shadow (patted on the lid, blended upward into the inner crease and outward). The cobalt blue shadow (Smudged over the midnight eye pencil along the upper lashline). Tom Ford Eye Defining Pencil in 06 Midnight (used to tightline and along the inner one-fourth of the lower waterline). What are some of your favorite Tom Ford Blues?